« Apologies for the downtime..
Just recently, Iâ€™ve been working on a solution for a client that wanted to create a meetings portal for a very formal meeting process. The basic breakdown of the site is as follows, A top level Site Collection housing http://meetings.contoso.com. This site was created with the default groups of Meetings Visitors, Members and Owners. 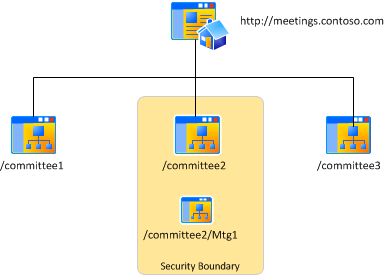 Then for each particular committee, there was a sub-web with Unique permissions, thus ensuring separation of the committees and ensuring that access was given to the correct groups. Meeting organiser uploads Meeting minutes and supporting documents. Workflows triggered inviting comment from the members group. Comments are approved/rejected and the content agreed. As you can see from the above, steps 1-4 are fairly standard out of the box SharePoint behaviours. The problem comes in Step 5. Not because weâ€™re doing anything strange with security, but because weâ€™re not doing it through the UI. Rather the client requirements were to provide a meeting management webpart that included an option to lock the site down through some custom code once certain attributes were valid. To verify the correct behaviour as experienced through the UI, navigate to the /Commitee2/Mtg1 subweb and choose Site Actions/Site permissions, youâ€™ll see the usual UI page showing you that the site is â€œInheriting itâ€™s permissions from itâ€™s parent (Committee2)â€ and underneath this warning, youâ€™ll see Committee2 Owners, Members and Visitors. This is as weâ€™d expect. The problem comes in the custom code for the site which breaks inheritance and then resets the permissions for each of the groups. The groups are obtained from the SPWeb object for the current site from context. When stepping through the code, I expected these objects to whole values similar to â€œCommittee2 Members Groupâ€ which should be the value inherited from the Parent. Instead, Iâ€™m receiving â€œMeetings Members Groupâ€ which is the Site Collection root group, completely ignoring the inheritance of the Parent. Bizarrely, if you instantiate an SPWeb against currWeb.ParentWeb and look at the same groups, you get the values that youâ€™d expect. Instantiating SPWeb.AssociatedMemberGroup does not return the value expected when inheritance is broken even when existing values are copied. It may be possible to look at the ParentWeb object and use itâ€™s values instead, however this is very Situation specific!